Red: A History of the Redhead | Your #1 Source for Kindle eBooks from the Amazon Kindle Store! The mere mention of red hair calls to mind vivid pictures. Stereotypes of redheaded women range from the funloving scatterbrain, like Lucille Ball, to the fiery-tempered vixen or the penitent prostitute (Mary Magdalene, for example, is almost always depicted as a redhead). Red-haired men are often associated with either the savage barbarian or the redheaded clown. But why is this so? Red: A History of the Redhead is the first book to explore the history of red hair and red-headedness throughout the world. 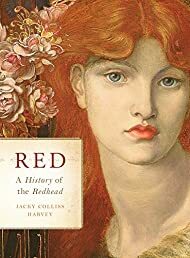 With an obsessive fascination that is as contagious as it is compelling, author Jacky Colliss Harvey begins her quest in prehistory and traces the redhead gene as it made its way out of Africa with the early human diaspora, only to emerge under Northern skies. She goes on to explore red hair in the ancient world (from the Tarim mummies in China to the Islamic kingdom of the Khazars); the prejudice manifested against red hair across medieval Europe; red hair during the Renaissance as both an indicator of Jewishness during the Inquisition and the height of fashion in Protestant England, where it was made famous by the Henry VIII and Elizabeth I; the modern age of art, and literature, and the first positive symbols of red hair in children's characters; modern medicine and science and the genetic and chemical decoding of red hair; and finally, red hair in contemporary culture, from advertising and exploitation to “gingerism” and the new movement against bullying. More than a book for redheads, Red is the exploration of evolution and gene mutation, as well as a compelling social and cultural study of how prejudice and misconceptions of “other” evolve across centuries and continents and are handed down through generations and from one culture to another.